Ground has been broken on my new garden in the hopes that there will be an abundance of wonderful veggies. Considering that the most experience I have is helping my parents plant vegetables and watching our family dog eat our patiently awaited watermelons and zucchini, I would call myself a first time vegetable gardener. There were one too many grape vines and wooden posts firmly planted in concrete a few months ago, which are now gone thanks to some back pain, sweat, and choice words. Now, I have space for yummy garden vegetables to be freshly picked and served at the family dinner table. 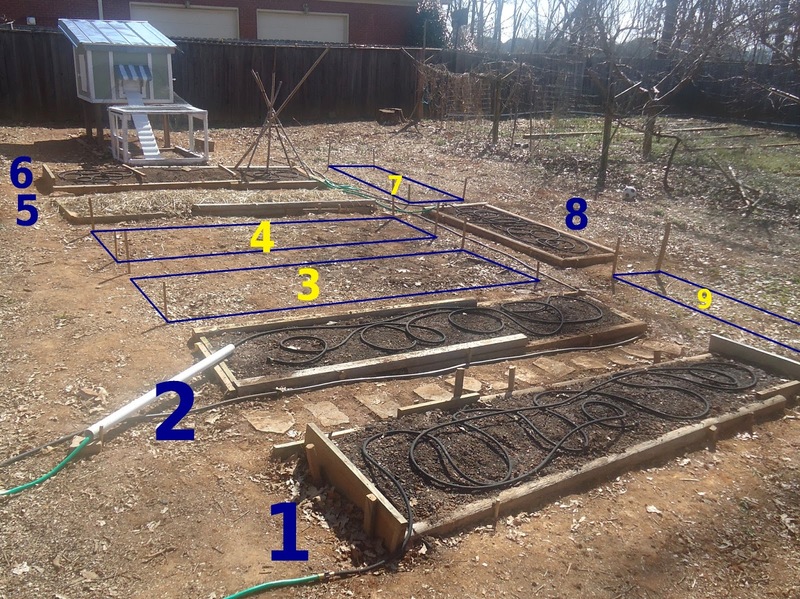 Here is my layout for our backyard vegetable garden. Mind you, it can be adjusted to in any way to suite your own needs. I used "Starter Vegetable Gardens - 24 No-Fail Plans for Small Organic Gardens" by Barbara Pleasant. It gave me ideas and the feeling that "I CAN" do this with some practice and hard work. Row 4: Will contain Tomatoes. Seeds were planted in early March because I am in zone 7. The beds you see here are shallow raised beds that contains conditioned soil that 12 inches deep into the ground. The soil is a combination of compost, top soil, and manure. The stones in between beds 1 and 2 are both functional and a good use of old materials laying around the yard. Soaker hoses seemed to be the easiest way to keep the beds watered with little difficulty. The pvc pipe in bed 2 is directing water inside the bed instead of watering the surrounding stepping stones. It works like a charm and conserves water. Bed 5, covered in hay, contains the potatoes and onions. I read somewhere that hay helps keep beetles and other creepy crawlies from getting to potato plants. To plant potatoes, you simply buy seed potatoes of your desired variety and cut them into pieces with around 2 sprouts on each piece. You sow each piece of potato at around 2 inches deep. The carrots in bed 6 haven't been planted, but I plan on adding them next weekend. The trellis is constructed out of bamboo poles, wire and re-purposed string from the bale of hay. The brass attachments were added because I wanted the ability to target certain beds. Is this necessary? Probably not, but my neurosis kicked in and needed it. As you can see below, I am utilizing both soaker hoses and a sprayer attached to a hose for watering the potatoes and onions as the hay retains more moisture and does not require the same amount of watering as the open beds. My husband said that if I buy any more plants, he would leave me. Damn! I'm going to miss that man! P.S. Your garden looks great! I hope it brings you much joy!